Istituto Svizzero is pleased to present “Delve of Spade”, the first solo presentation in Italy by the Swiss based artist Mathis Altmann. “Delve of Spade” is an antiquated term. It is out of fashion, yet evokes weathered, vintage desires. Rarely used in contemporary English, its German equivalent, Spatenstich, is commonly used to describe the ceremonial act of breaking the soil to celebrate the construction of a new building. It is an artisanal first dig, executed by hands before heavy machinery takes over. It is a nostalgic act that harkens back to bare naked human effort and the suffering blistered hand. 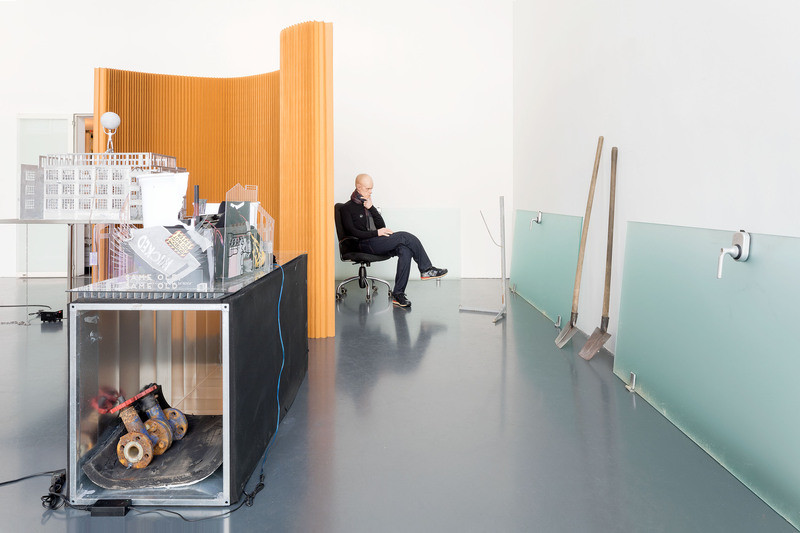 Altmann’s exhibition connects issues mined in his previous projects this year: the growing ubiquitousness of tech-related aesthetics in urban architecture, commerce, and social interaction. Resonating from his sculptures is an attempt not to lecture, but to render inefficient these same objects that power commercial desirability. Claims on clear positions disappear into a dreamscape, and questions about models of rejection and embracement appear. Central to the exhibition are new sculptures and an installation which mock open workspace environments, a common aesthetic turned global phenomena throughout trade-oriented metropolitan centres. These areas designed for the needs of cognitive workforces and new form of mobile, transient labour. Homogenous and repetitive, so recognizable so as not to distract. Streamlined for efficiency. Easy to plug into. Altmann’s commute to his studio in Los Angeles takes him through an explosion of the latest test-epicentre and its offshoot urban developments. One of them is known as “The Arts-District”, a former industrial dead-zone turned “Fallout zone”(in the artist’s words), supercharged with designer protein supplements and real estate on steroids that intimidate neighbouring cities. Capturing encounters in the “Fallout zone”, Altmann funnels materials and re-created developments into narratives for his sculptures. In “Delve of Spade”, like in a play or film, objects become scenographic tools. Mathis Altmann (b. Munich, 1987) lives and works in Los Angeles and Zurich. Recent solo exhibitions include: Art Basel: Statements, Basel (2018), Freedman Fitzpatrick, Paris (2018); Freedman Fitzpatrick, Los Angeles (2017); Swiss Institute, New York (2016); Truth & Consequences, Geneva (2016); Paramount Ranch 3, Los Angeles (2016); and Halle für Kunst, Lüneburg (2015). Recent group shows include: October Salon, Belgrade (2018); MD72/Galerie Neu, Berlin (2017); MAAT, Lisbon (2017); and Palais de Tokyo, Paris (2016). His work is in the collections of Fonds Cantonal d’Art Contemporain de Genève, Geneva; the Hammer Museum, Los Angeles; Mobilière, Bern; and The Rubell Family Collection, Miami. He is a recipient of the Prix Mobilière (2016); the Swiss Art Award (2015); Zurich Atelierstipendium (2014); and ZKB Art Award (2013).